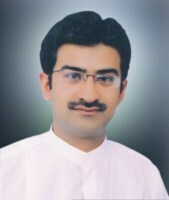 Mr Khurram Ijaz son of Mr Ijaz Ahmed was born on September 10, 1980 in Lahore. After obtaining his early education from Lawrence College, Murree he graduated in 2001 from Government College, Lahore; and obtained the degree of M.Sc(Anthropology) in 2004 from Quaid-e-Azam University, Islamabad. A businessman and a landlord, who served as Member, Provincial Assembly of the Punjab during 2008-13, 2013-18 and has returned to Punjab Assembly for the third consecutive term in general elections 2018. He has functioned as Chairman, Standing Committee on Communication & Works. He visited UK and Belgium in 2010 to attend seminar arranged by Commonwealth Parliamentary Association. He has also travelled to USA in 2011 to attend Pakistan Fellowship Programme arranged by ACYPL. His father, served as Member, Punjab Assembly during 1990-93. Chak No.34, P.O. Mannoabad, Tehsil Muridke, District Sheikhupura. Chattha House, P.O. Mannuabad, Tehsil Muridke, District Sheikhupura.